In the foreword of this long overdue volume, Les Murray writes that he considers Lesbia Harford to be ‘one of the two finest female poets so far seen in Australia; the other has to be Judith Wright’ (xviii). This is an extravagant contention, but it is not without foundation. Further, Murray’s claim warrants being extended beyond the confines of gender for, to my mind, Harford should be just as readily compared to some of Australia’s finest male poets including Les Murray, Kenneth Slessor, A. D. Hope, Bruce Dawe, Douglas Stewart, David Malouf and David Brooks (albeit that the tenor of Harford’s poetry is decidedly less conservative than some of these poets). Accordingly, it is quite tragic that Harford has, up until now, occupied such a minor place in Australian literary history for, as this volume amply attests, she produced what can only be described as some of Australia’s most evocative poetry. When they loved, would kiss. Harford’s reference to Sappho carries more than a little weight, because if there is one poet that she most resembles it is Sappho. While Oliver Dennis, the editor of the collected poems, notes the Janus-like nature of her writing in its ability to look ‘both forwards and backwards’, he largely links the latter capacity to ‘Pre-Raphaelite influences’ (xix) and at another point, suggests that her poems ‘recall those of Shakespeare, Keats, Emily Dickinson and Edna St Vincent Millay’ (xxii). While one cannot argue with these assertions (particularly in relation to the openly bisexual and often controversial American poet St Vincent Millay), his claim that ‘she left behind three notebooks containing some of the finest lyric poems ever written in Australia’ (xix) is lent more authority if one takes Harford’s direct invocation of Sappho as a portal to her poetic sensibility. 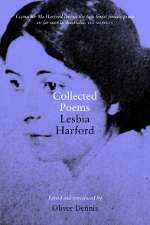 As Dennis notes, ‘Harford is said to have sung her poems aloud, memorably on the Manly ferry,’ (xix) and certainly most of Harford’s sensual and melodic poetry, like Sappho’s, appears to have been composed to be sung out loud. Instead of being accompanied by a lyre, however, Australia’s musician-poet and modern day version of Sappho was fittingly enough accompanied by the rolling waves against one of our most iconic modes of transportation. Harford’s beautifully concise and eloquent poetry is also exemplified in the compact but vivid poem about her husband ‘Pat wasn’t Pat last night at all’ (115) and the secular poem which reaches for religious transcendence ‘I am no mystic. All the ways of God’ (129). This is exactly what Harford achieved, and this necessary and important volume of her collected poems makes this more than evident. This entry was posted in BOOK REVIEWS and tagged Lesbia Harford, Sappho, Shale Preston. Bookmark the permalink.